Want a more attractive smile? If so, you’ve come to the right place. We are James Otten Dentistry, and our cosmetic dentist in Lawrence can help you achieve the smile of your dreams. We offer a variety of cosmetic dental procedures, from teeth whitening to full mouth restorations, but we know that there are also plenty of things you can do on your own to achieve a smile you can be proud to show off to the world. 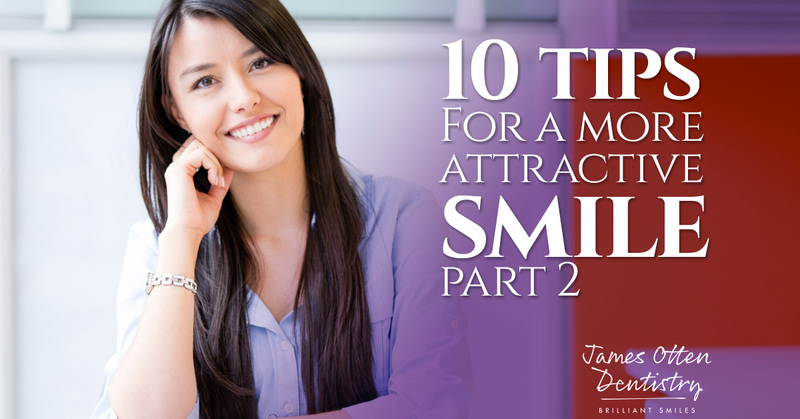 In Part 1 of this series, we went over the first five tips for a more attractive smile. Keep reading to learn about the last five. When you brush your teeth, you should also make it a point to brush your tongue. Bacteria can build up on your tongue, which can make your breath less than pleasant. But bad breath isn’t the only negative that comes with skipping brushing your tongue. That same bacteria that cause bad breath can also lead to discoloration, but by simply brushing your tongue when you brush your teeth, you can get rid of it. #7. Eat foods that help to keep your teeth clean. Did you know that some foods can actually clean your teeth as you’re chewing them? Foods, like carrots, apples, celery and even popcorn, are all considered to be “detergent foods” because they help to scrub the teeth of plaque and bacteria while you chew. Make it a habit to snack on these foods on a regular basis. #8. Drink plenty of water. There are so many reasons to make drinking water a priority in your life. For one, water helps to wash away bacteria and food particles left behind after you eat, which can cause discoloration and plaque if left for too long. You also need to drink plenty of water to keep your mouth from getting too dry. Dry mouth can lead to all sorts of problems for your teeth and mouth, but if you make it a point to drink lots of water, you can avoid it. Last but not least, the more water you drink, the less you’ll be drinking other beverages that could stain or damage your teeth, like soda, fruit juice, etc. #9. Limit teeth-staining foods and drinks. As we mentioned above, some foods can actually help to clean your teeth, whereas others can cause stains and discoloration. Some of the biggest stain culprits include tea, coffee, red wine and berries, and limiting these in your diet can help to keep your smile bright and white. If you do consume them, limit their contact with your teeth by sipping the drinks through a straw, and don’t forget to rinse your mouth with water when you’re done. #10. Don’t attempt to whiten your teeth on your own. There are so many over-the-counter whitening products out there that it can be tempting to try to whiten your teeth on your own. However, if you’re truly concerned with the health and appearance of your teeth, you’ll be much happier with professional whitening. There are many things you can do on your own to achieve a more attractive smile, but for everything else, there’s James Otten Dentistry. Schedule your appointment today.